Hi friends! 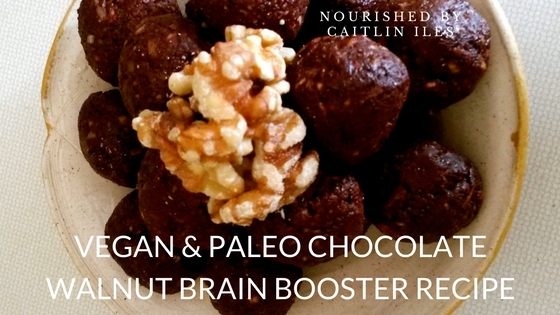 I hope you’re all having a splendid week 🙂 I’ve been pretty busy with my fingers in various pots; writing, working with clients, teaching yoga, and of course working at the bakery.Today I want to share with you one of my new healthy treat obsessions: Chocolate Walnut Brain Boosters Recipe. In order for your brain to function optimally you need to give them the nutrients that they need. Some of the primary fats our brains use are DHA and EPA. When I’m working therapeutically with a client I always recommend that they supplement with a pure fish oil to get to the adequate levels, but once you’re in maintenance mode you can rely more on whole foods to supply these nutrients. A couple servings of cold water fish such as salmon, mackerel, sardines, or trout can go a long way to giving you the right amounts to keep your brain healthy and happy. In addition to fish, you can also use certain nuts and seeds in appropriate amounts to help boost your intake. You just want to be sure you’re not going too crazy with them as they can be difficult to digest and contain omega-6 fats, which, when eaten in excess, can up-regulate inflammation in the body. However, if you’re avoiding toxic refined vegetable oils some servings of healthy walnuts, almonds, and hemp hearts are unlikely to lead to problems. Another important aspect of brain health is managing inflammation, which the walnuts will help with (ever notice that they look like little brains and that they’re good for your brain? Coincidence? I think not!). Avoiding refined sugars is also a great way to manage inflammation in the body as unbalanced blood sugar can contribute to inflammation. There are even some studies coming out that link excessive sugar consumption with degenerative brain issues such as Alzheimer’s disease. In light of that, this recipe relies on dates, which contain healthy sugar and lots of fiber and antioxidants. The reason I added the palm sugar is that I originally made this recipe with prunes and so it was less sweet. If you’re using the dates I would suggest mixing it all together without the palm sugar and tasting it to see whether it’s sweet enough then slowly adding a bit of palm sugar in until it gets to the appropriate level. Don’t go over 1 cup though! Just because it’s a relatively unprocessed and low-glycemic sweetener it’s still sugar. Once dates are soft, drain off extra liquid and puree in a small food processor or blender with vanilla and coconut oil. Set aside. Stir together walnuts, coconut, and cacao until thoroughly combined. Add dry mix to wet mix and stir until combined. You may need to get in there with your hands. Take a small amount and roll into balls of preferred size. Set in freezer until hardened. Well there you are friend! A brain-loving treat you can nibble on to stay full and happy all day long. If you want some more super simple and delicious snack ideas make sure you download my FREE Sensational Smoothie E-Book by clicking here.